This 7th Vegan MoFo post isn’t about traveling, but a dish that I made in Valencia, Spain. Inspired by Holly of Traveling Pink Lips on Instagram, I said to myself, why not make this godly creamy chickpea mash since chickpea jars are cheap in Spain (€0.51 or $0.67 per 400g jar)? The creamy chickpea mash is easy to make as long as you have vegan mayo on board (or you can make this with Luminous Vegans’ gobsmacked cashew cream, but the cashews are quite expensive in Spain). I made the vegan creamy chickpea mash twice so far and improved the 2nd recipe. I love to eat it on its own for breakfast or even midnight snack (yeah it is appropriate for any meals). The flavors just blend so effortlessly and it truly becomes addicting. 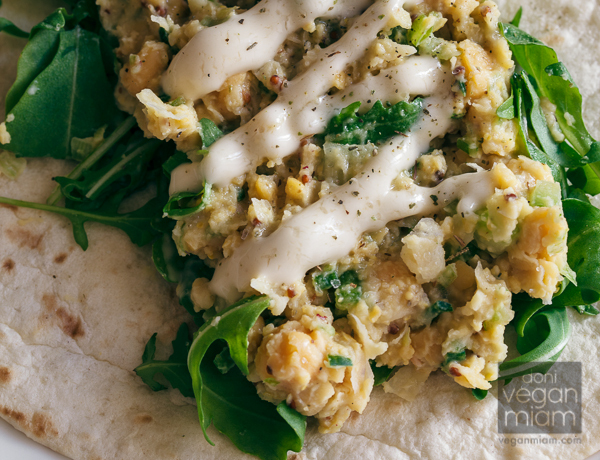 The creamy chickpea mash reminds me of a mashed potato salad (almost the same consistency). ok, where’s this vegan mayo you’re talking about? 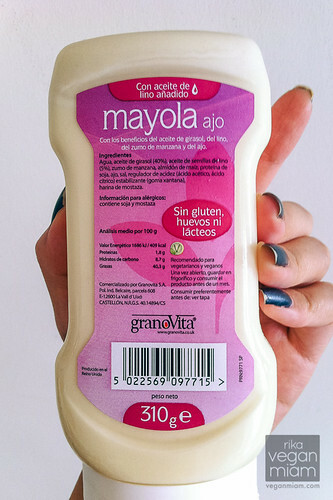 I mentioned this vegan mayo in my earlier post on “Vegan Finds at Groceries in Valencia, Spain” (view the post here). 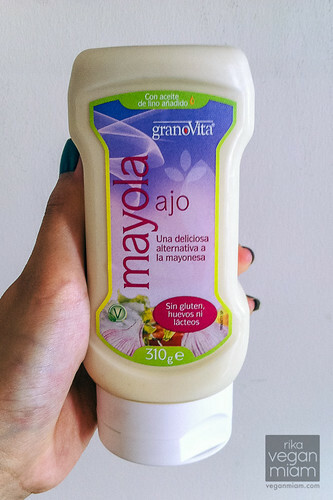 We found this vegan and gluten-free mayo with garlic by Granovita at this cool shop in Spain: Herbolario Navarro. Ingredients are pretty simple: sunflower oil, water, vinegar, apple juice, soy protein, corn starch, sea salt, garlic and mustard. It reminds me of a thick salad dressing, but creamy. 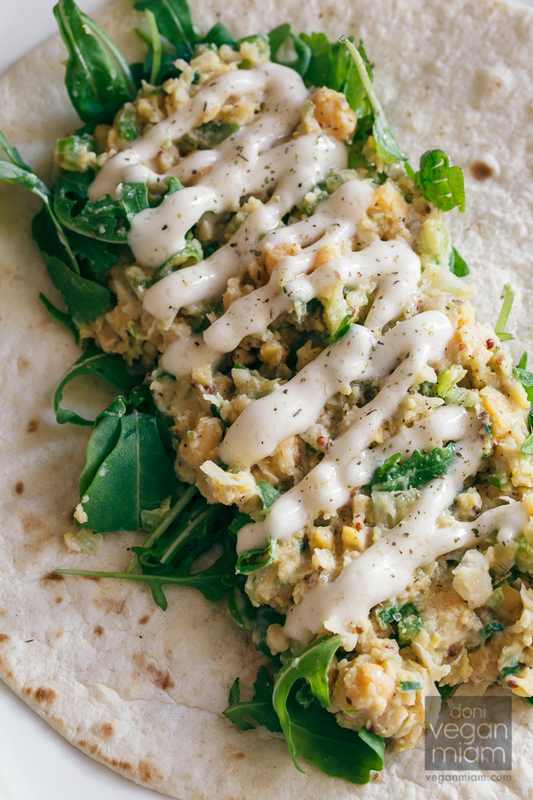 It’s really good in sandwiches or on its own with raw veggies. I didn’t taste the garlic at all, but it is still good though! “Granovita was born in 1899 as a company in the town of Friedensau (Germany) and it was in 1984 when their presence in Spain was tangible” (Granovita – About Us). any other new ingredients added to the salad? I also used Violife Cucumber & Dill creamy spread in this mash, but it’s optional. I love this creamy spread, it reminds me of tzatziki with the fresh dill and cucumbers. You can add fresh dill and a bit of vegan plain yogurt or mayo instead. You didn’t feel the need to get cucumbers & dill on a rye bread or a piece of sandwich because it fills that in. I contacted Violife to review their cheese products after learning about it through few friends in Germany and the UK, and I will be reviewing their other products, so stay tuned. 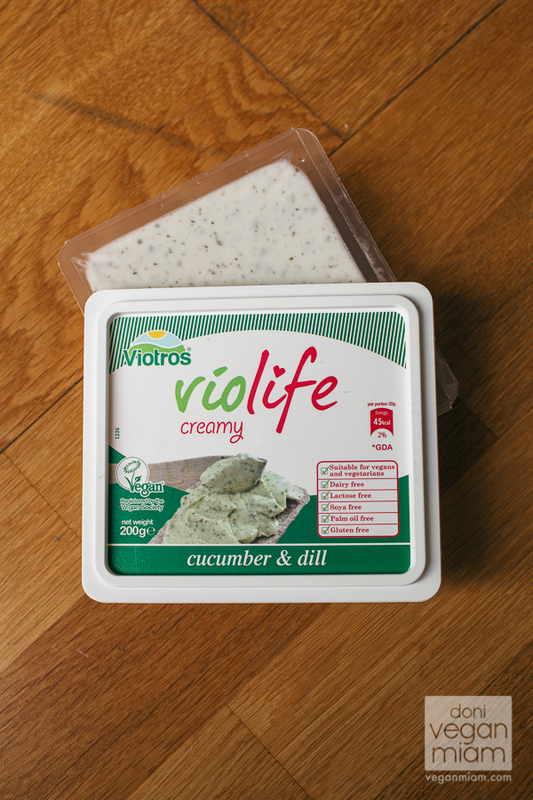 Based in Greece, all of Violife cheezes and creamy spreads are vegan, soy-free, gluten-free and palm oil-free. 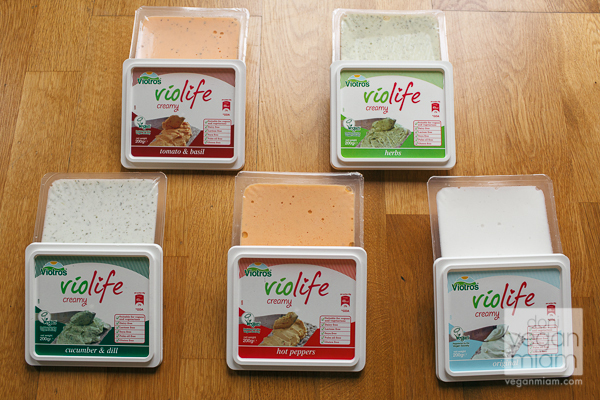 The Violife cheeze products are found only in France, Germany, Greece, Holland, Hungary, Poland, Slovenia and the UK. 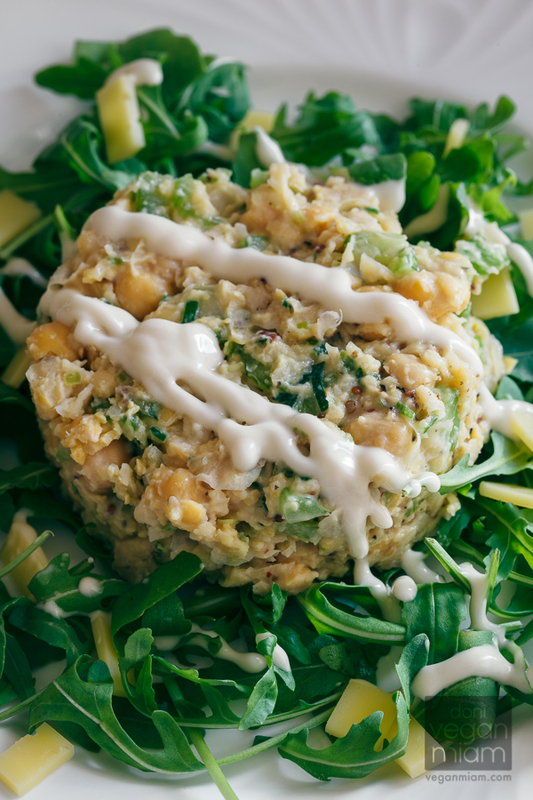 In a medium bowl, mash the chickpeas and the mayo with a fork. Add the rest of the ingredients and mix well. Store it, covered, in the refrigerator for 2-3 days. It's better to eat it once cold. 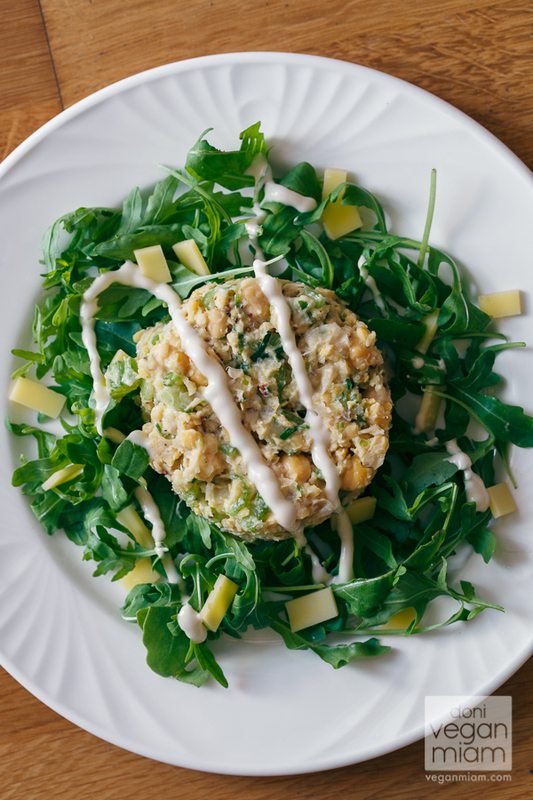 You can make perfect “creamy chickpea mash” patty atop a bed of arugula with Violife Herb Cheeze slices and a bit of creamy dressing (i.e., my cilantro-tahini dressing). Do you like chickpeas? 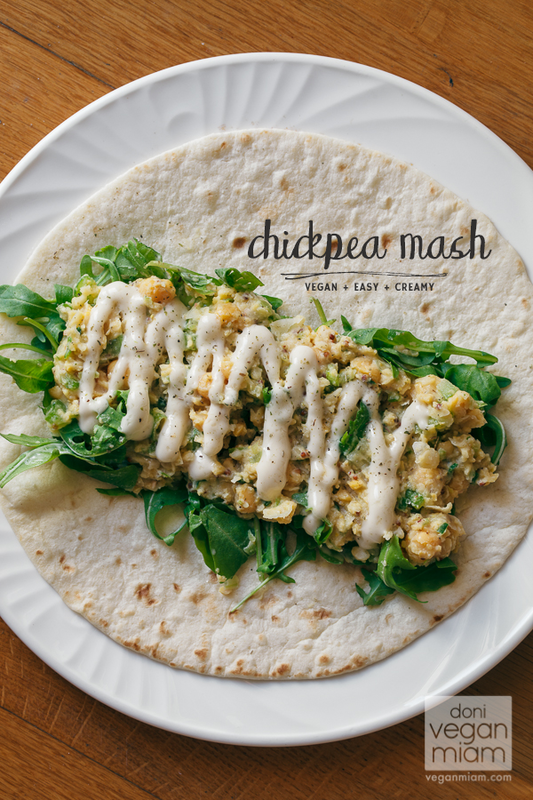 Have you ever made chickpea salad or mash before? What will you use it with? This item(s) was kindly sent to me to review by Violife. All products that are mentioned and reviewed here on this vegan blog are of my own personal opinions and I am not being compensated to review them, only just to share my thoughts. If I receive a product complimentary of the company, it will be stated so in the post, otherwise, all products are purchased myself for my own personal use.